Patna is the ancient city that sprawls along the south bank of Ganges River in Bihar. It is the second largest city in eastern India. Patna is the capital city of Bihar state. There are many educational institutions those offer the quality education in the engineering field. The literacy rate of Patna is 84.71%. 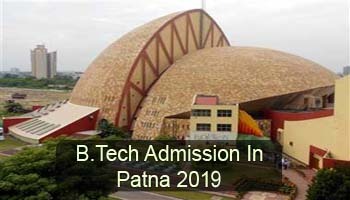 In this article, we are providing the detailed information about B.Tech admission in Patna 2019. Candidates those seeking admission in engineering courses can apply for national level and state level entrance exams. Some universities conduct their own admission test for providing admissions into B.Tech programme through the direct admission procedure. JEE Main 2019 is the main gateway to get admission in the reputed engineering colleges of Patna. Candidates those seeking admission can appear in the national level entrance exam which is conducted by the NTA board. There is an entrance exam which is conducted on a state level by the name of BCECE 2019. Through JEE Main candidates can get admission in four years of B.Tech & B.Arch course. There is the number of government and private institutions those offer the quality education in the field of engineering. Some of the famous top colleges are Indian Institute of Technology Patna, National Institute of Technology Patna, Netaji Subhas Institute of Technology, etc. The basic eligibility to appear in the entrance examination is given below. Candidates must fulfill these eligibilities to appear in the entrance test. Candidate should pass the 12th or equivalent exam from a recognized board. Physics, Chemistry, Mathematics, and English should be the mandatory subjects in Intermediate. Candidates should score the minimum of 50% marks (45% in case of reserved categories). The admission procedure will be conducted by the respective authorities as per the schedule prescribed by them. After a few days of the declaration of the result, the candidates have to register for the counselling on the respective website. It is necessary to verify the original documents for the allotment of seats. Candidates have to fill their choices of course & colleges in the counselling round. The counselling will be conducted either online or offline mode depending on the authority. After the choice locking procedure, the seats will be allotted to the candidates on the basis of their ranks in the merit list and preferences. Candidates have to report the allotted college to complete the further formalities of admission. Candidates must carry the documents given below in original along with one set of photocopy while appearing for the counselling. If you have any other queries about B.Tech Admission in Patna 2019, you can write your queries in the comment box given below. I am pursuing my diploma course in electronic engineering from sbte polytechnic bihar. I am in last year and after diploma I want to get admission in b. Tech lateral entry. Please help how can I get admission in Patna b. Tech (LE).